It’s safe to say, of late, I’ve been stressed. Really stressed. Whether it’s the endless Christmas features, freelance projects, finishing the last module of my OU degree and even the gym; I am at my wits end. The result of this has been a swamp of fabulous red pustules and blocked pores. They’ve truly been the icing on the bloody cake. Despite my best efforts to remain hydrated and use deeply hydrating (but non-comodogenic) products, this has all been in vain. This has left me with only one option which I’m rarely a fan of… treat the symptom. But this Thursday I have an event that I’ve been looking forward to for a while and it’s always the case that you break out before something like this when you need to look your most fresh. I’ve been trying my Clinique Anti-Blemish Solutions Clinical Clearing Gel; this time that made things worse as it dehydrated my skin even more. I’ve used my trusty Bionova Acne Treatment; this did nothing and then I even used the Aesop Control Anti-Blemish gel that I’m yet to even review… nothing. 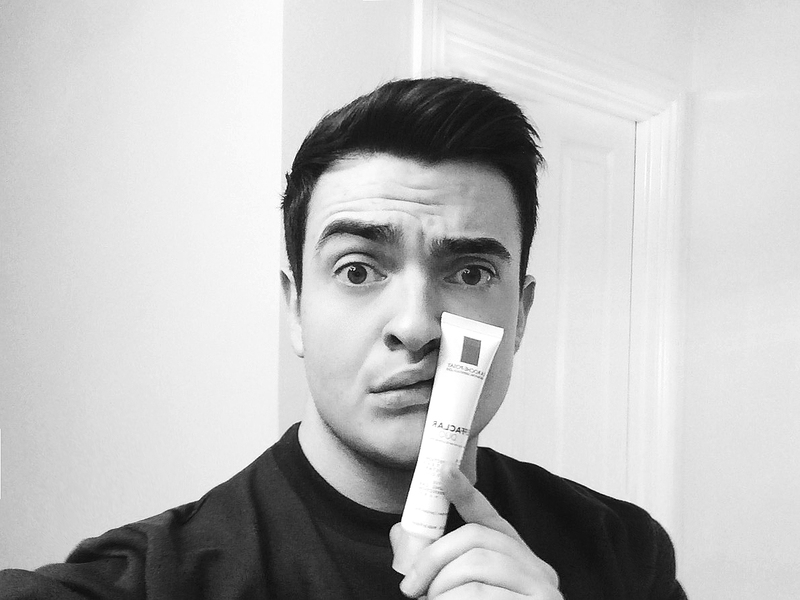 Why I forgot all about La Roche-Posay Effaclar Duo Plus [+] (reviewed), I have no idea. But in 24 hours, I kid you not, they’ve dried up and the redness massively reduced (the redness of my blemishes can stay around for weeks after the event). I could cry. Hence why I’m writing this ’emergency’ post to really share the love. I’m not using it as a moisturiser, it’s faaaaar too drying on its own if you have a normal/combination skin type, but instead, as a serum. At the moment I’m using Créme de La Mer Cleansing Gel (reviewed) and then The Treatment Lotion (reviewed); I was using Clinique Smart, which I love, but have changed it over for La Roche-Posay Effaclar Duo Plus [+] (reviewed) , and then finishing off with Bobbi Brown Hydrating Gel Cream (review imminent). Oh and for eyes it’s Créme de La Mer The Eye Concentrate (reviewed) to rehydrated and brighten my tired looking eyes. La Roche-Posay Effaclar Duo Plus [+] is available at the best price I could find here of £15.10 including delivery from Escentual. This article first appeared on MANFACE written by Thom Watson. It was published on Tuesday 9th December 2014 and was last updated on Monday 3rd April 2017 at 1:43pm. It's categorised under Editorials where you'll find more related content. I adore this stuff! I’ve been using it for about two years and it’s still a staple in my regimen. I use it as a morning moisturiser as I have oily skin and it helps my makeup stay put all day as well as acting as a protective barrier and treatment. Adore it.